A strained Achilles tendon is one of the most common injuries for athletes, especially runners. To ease the pain for good, you must discover the hidden causes that might be to blame. When Achilles tendon pain shows up, most people immediately try one approach to fix it: stretching the lower legs and feet. While their intentions are good, this strategy (unfortunately) is not. Trying to stretch the problem of a strained Achilles tendon away is like picking a scab. It may feel somewhat satisfying, and almost like you’re scratching an annoying itch, but it’s not doing anything to help healing. In fact, the act will just reopen the wound and prolong the process. If you were expecting to learn a bunch of stretches for your Achilles pain in this article – think again. What you will get is a deeper understanding of the issue, habits that might be unintentionally contributing to your pain, and EFFECTIVE strategies that keep the real root causes in mind. A strained Achilles tendon, or Achilles tendinitis as it’s sometimes called, is an extremely common injury – about a quarter of all athletes and HALF of all runners will experience it at some point . In these super common cases, an injury (like a microtear or irritation) occurs in your Achilles tendon, which runs up the rear of your foot and lower leg. This injury causes a variety of painful and irritating symptoms. Most people feel pain in the back of their heel and ankle, and sometimes farther up the rear of the calf. You may also experience swelling and tenderness. It is also common to feel tight and stiff in your ankle or calf – especially when you first start walking, say right after getting out of bed in the morning or after a long meeting sitting at your desk. In some cases, the pain will ease up significantly once you warm up. However, in more severe cases of Achilles tendinitis, the pain can keep you from working out, or even interrupt daily activities like walking your dog  or going up stairs. So what exactly is this tendon that can cause so much pain and bring your workouts to a screeching halt? Your Achilles tendon runs down the back of your lower leg from both major muscles of your calf – your gastrocnemius and your soleus . The tendon then crosses the rear of your ankle and attaches to your heel bone, or calcaneus. It is actually the biggest tendon in your body, and it plays a crucial role in how you get around – Your Achilles provides a whopping 90% of your foot’s plantarflexion force . This motion, which is used when you point your toes down, allows you to push your foot off the ground. Because of this, it helps you generate a lot of the force involved in walking and running. Your Achilles also aids in energy transfer in your lower limb. 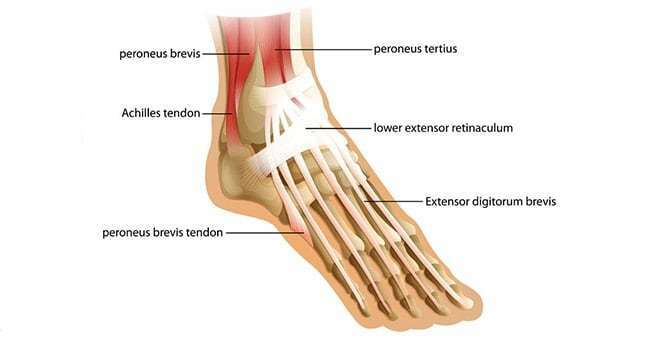 The tendon absorbs shock and provides elasticity, which contributes to energy conservation and proper body mechanics. And it does all this while supporting the HUGE amount of tension and force produced by your lower leg during activities like running . This is a tendon designed for power thanks to its size, thickness, and elastic nature. Your Achilles plays a key role in your performance in pretty much any sport. From running down the field during a soccer match, to jump squats during cross fit, to layups in basketball, and maintaining a light, springy boxer shuffle in the ring… your Achilles is at work. It is hard to get around it if this tendon is getting in trouble. So instead of just trying to mindlessly stretch the pain away and hope it works, let’s take a deeper look into what’s actually causing the pain so we can understand what will actually fix it*. Unfortunately, just because this tendon is big and powerful doesn’t mean it isn’t easily aggravated. There are a couple different possible causes of a strained Achilles tendon, some of which are pretty clear, and some of which are a little more sneaky. If the strained Achilles tendon is from a one-time traumatic event, like a fall during a soccer match, you’ll probably know exactly what caused your injury and exactly when it happened. If this is the case, all that’s necessary to treat the injury is a standard healing protocol for acute injuries. This means following RICE standards – Rest, Ice, Compression, and Elevation. Take it easy, apply cold, use compression, and elevate your foot in short bursts throughout the day. You can also try a turmeric supplement like PuraThrive to help ease inflammation. Another pretty obvious cause of Achilles tendonitis is over training. Again, you’ll probably know what happened to cause your pain if you suddenly jumped into a brand new, intense workout or running regime. These overtraining injuries might be from something like adding on too many miles too quickly or adding more jumps into a workout than your body was prepared for. An overtraining Achilles sprain can also develop if you dive into barefoot running without transitioning properly, or even if you spend too much time in high heels when you aren’t used to it. Either way, you are putting excess strain on an unprepared, undertrained tendon. The solution to this kind of injury is first to rest, and then to focus on strengthening the calves. Ramp your workouts up GRADUALLY – trust me, you’ll be better off if in the long run if you take it slow at first. If an acute injury or overtrained aren’t to blame, there are a couple of less obvious, but still common causes behind an Achilles injury. These hidden causes are especially pertinent when it comes to recurring or chronic Achilles strains. When these hidden causes of Achilles tendinitis are ignored, missed, or just plain misunderstood, the injury isn’t rehabbed properly and never fully heals. This sets the tendon up for a repeat injury, and the cycle continues because you don’t know what’s causing the pain or how to fix it. There are 3 major hidden causes of a strained Achilles tendon. Dorsiflexion is the movement required when the toes are pointed up, or move toward your calf. This motion is required during a huge range of activities, including uphill running, squats, and step-ups. When the ankle is limited in its ability to dorsiflex, it causes excessive stretching of the Achilles tendon every time a position or motion involving dorsiflexion is achieved. That means with every step up the stairs and every squat, limited ankle mobility could be putting excess tension on the Achilles, setting it up for injury. Your tibialis posterior is a deep muscle of your lower leg that runs from along the back of your tibia (shin bone) to the foot. This muscle, like the Achilles, is also involved in plantarflexing your ankle , and the two are innervated by the same nerve, the tibial nerve. If your tibialis posterior is weak or inactive, it will cause your calf muscles and Achilles to be overworked whenever you need to make a movement involving plantarflexion – setting your Achilles up for a strain in the process. To combat this hidden cause of Achilles injury, you’ve got to focus on restoring strength and function to your tibialis posterior. The intrinsic muscles of your feet are located entirely within the foot and are responsible for the finer movements of your foot, and for helping support your foot’s arches . If you’ve got dysfunctional or weak intrinsic foot muscles (which also share innervation with the Achilles), you might experience a collapsed arch or flat foot. Your foot might also start to rely too much on surrounding musculature – including the Achilles itself and that tibialis posterior again! The solution to fighting this hidden cause of a strained Achilles tendon is to restore your intrinsic foot function and strength. To rehab a strained Achilles tendon, you’ve got to use techniques that will effectively address these hidden causes. The following 3 techniques will help you recover from the pain of this injury and keep it from returning. This mobilization drill will help increase ankle dorsiflexion, which in turn will reduce excess strain on the Achilles. Set a band up low to the ground. Place the band just above your ankle joint and step forward so there’s a bit of tension. Start to bend into the knee and drive forward slowly so that your ankle dorsiflexes. Be sure to keep your heel on the ground as you move back and forth with control. This motion will help to mobilize and re-align the joint. This move will help improve ankle dorsiflexion while also addressing hip flexion (more bang for your buck!) And it will not only help you mobilize the ankle dorsiflexors, it will help you strengthen them as well. After warming up with the above technique, add on this drill. This addition will help you increase the strength and function of your intrinsic foot muscles, while also getting all the ankle dorsiflexion benefits of a deep squat. Slowly and with control, start to move your body forward by using the muscles of your feet and your lower leg – NOT by leaning! If the deep squat position isn’t accessible, try this drill while standing on one foot! Take time to consider the potential hidden causes that could be behind your strained Achilles tendon, then try these drills to help you rebuild strength, increase mobility, and encourage proper muscular balance. Your pain should start to ease up, and best of all – it should be less likely to keep returning!